Another busy week and thankfully only a couple more to go until the Spring festival when I will get some time to relax a little more, perhaps. Most of this week was spent finalising my paper before submitting it to the Arxiv which I finally took the plunge and did on Thursday. It's a scary moment to press the button and release my own work to the community to ignore/delight in/tear apart at their pleasure. So far I've got some friendly responses from people, mostly asking to be referenced. So this leaves a bit of a void in my work life at the moment. This work has taken a couple of months from start to finish which was quicker than I was expecting so now I have some decisions to make about the next direction for research. Currently I'm just reading through some books attempting to learn techniques that I should have learnt a long time ago. There are a few options of the next project on the horizon but all are looking a little hazy at the moment. One evening this week was spent in the flat of a couple of Uyghuirs whom I met in the lift and started chatting to. Had a pleasant evening drinking tea and finding out about a very different side of China. Uyghuir also known as Xinjiang takes up one sixth of the size of China and with a population of around 13 million is a mix of mountains, deserts and oases along which the silk route still runs. The Uyghuir people look very different from the Han people who make up most of the Chinese population, and are more akin to the Turkic peoples of whom Kazakstan and Kyrgystan border their province. Predominantly Muslim, there are great frictions between Xinjiang (know as an autonomous region) and the Chinese government for whom China is supposed to be a purely secular state. Lots of interesting views on the Chinese government and state of the province at the moment which I shan't share online. Anyway, a very friendly couple of Urumqians (the capital of the province) who have promised to take me to a Uyghuir restaurant some time and to go and listen to some of the traditional music which sounds intriguing. Friday morning was somewhat frustrating with a three hour lecture on a subject I'm looking forward to learning about in a lot more detail. I don't know why they don't learn that a three hour lecture without breaks is an almost pointless activity, especially when the subject you're trying to teach is rich in formalism and symbolic manipulation. By midday I was hungry and tired and hadn't taken in anything for the last two hours or so. Friday afternoon and the first of the student seminars went OK. The trouble is that the students are so shy that they feel too inhibited to clap, so the end of the seminar is a rather deathly silence. As I don't know quite when the speaker has finished (as again it was in Chinese) it was only when everyone started getting up to leave that I started clapping and everyone joined in. I just find it really rude when a student has made the effort to stand up and give a seminar and nobody has the decency to thank them. Anyway, perhaps if I do this enough they might start clapping automatically, it just seems like common courtesy to me. Incidentally, this isn't me trying to bring in my funny Western ways. In the official departmental seminars people do clap, I think it's just shyness from the students in a small group that leaves the noiseless finale. Friday evening was spent taking it easy as I still didn't feel fully recovered from the food poisoning earlier in the week but Saturday I wanted to take full advantage of and so set out into the city once more. 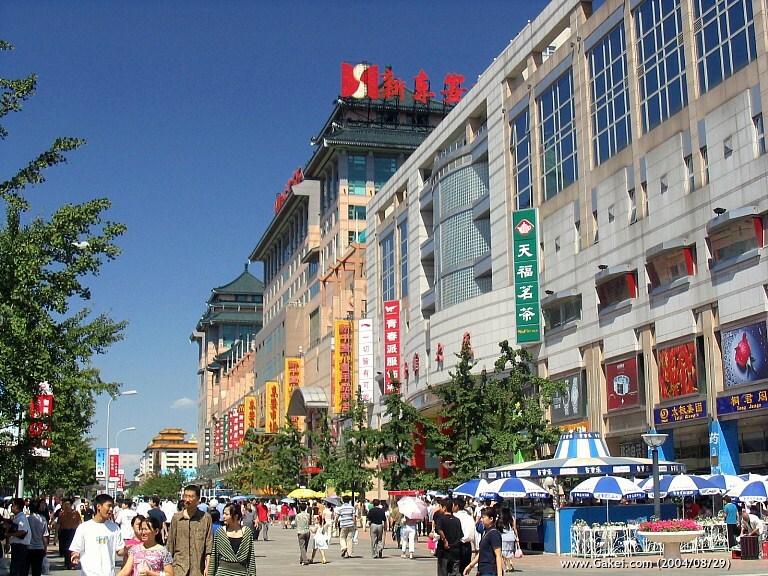 I headed to Wangfujing, the main shopping area, though shopping was the last thing I wanted to do. After a tasty lunch in a Muslim restaurant I spent the next half an hour walking around with a constant stream of people wanting to practice their English with me and coincidentally to show me their art galleries just around the corner. I went along and saw some very fine work. Lots of silk, calligraphy, lacquer work but they all seemed rather disappointed when I explained that I was on a Chinese wage and suddenly the need to practice their English evaporated. Anyway, I now know for next time. Art was the focus of my trip as I headed towards the Beijing Art Museum which promised to be a large, diverse collection of China's art through the ages. I may well have seen China's version of Da Vinci, possibly. I could have seen the Sinologue equivalent of the Venus de Milo, perhaps, and I might have been looking at Beijing's Tracy Emin. Unfortunately, in Beijing's largest art gallery there isn't a word of English so I've got no idea what I was looking at. Though I've read bits and pieces about the history of Western art, apart from some of the very big names, I've got no idea about the story of Chinese art and so, although faced with some stunning pictures, I was underwhelmed by lack of context. I can appreciate a piece far more if I know the symbolism and some of the background of the artist and the time so in the three or so hours I spent wandering around the gallery, I felt pretty lost at what I was looking at. That said I think that given the correct information, the museum would be a stunning collection of some of the prime examples of Chinese painting, fabric and sculpture. This is somewhat surprising on the Chinese part who know that they have an increasing market for foreigners who don't speak Chinese. I would have written something for the suggestion box but I don't know the word in Chinese and none of the staff spoke any English. Another fun night out on Saturday night though I headed home earlyish to try and beat off the cold that is currently creeping up on me. Though I'm now fully under the influence of a cold passed on to me by somebody whose coughing and hacking would make Felix Unger look normal, this week promises some more interesting activities. I shall report back forthwith. Jon - Happy New Year! TH, a very happy New Year to you too. Your plans sounded great. Thanks, with your encouragement I've now sent an e-mail to the museum with the simple suggestion and await a reply...will see how Chinese museums react to this sort of thing. As for making the paper up, they'll be so blinded by the stunning 3d plots that they'll never know, let alone spot the hidden messages! Glad to see you have made it out this far! I spent the last two years in South Korea. It was a fantastic experience. I am sure you are finding the same in Beijing. Well, after two years, tons of kimchi and litres of soju I have been prised way from Korea and made the move to Taiwan. Anyway, it's good to see that you have a blog and it'll be interesting reading about your adventures in Beijing. How is your Chinese? JP, the Chinese is coming on pretty slowly right now. I have a couple of hours of tutorial per week and get to practice at most four hours outside the lesson. I have enough to get by in shops and most forms of transport though beyond the simplest sentences I'm still pretty lost. My listening is getting better as I spend my lunches surrounded by spoken Chinese. Frustrating at times but I think that however slowly it's happening, I am improving. HW, if you could take digital snaps of the captions and send them to me, I can go to the museum and post them on those pictures which seem most appropriate. With international collaboration I think we can clear up this mess.